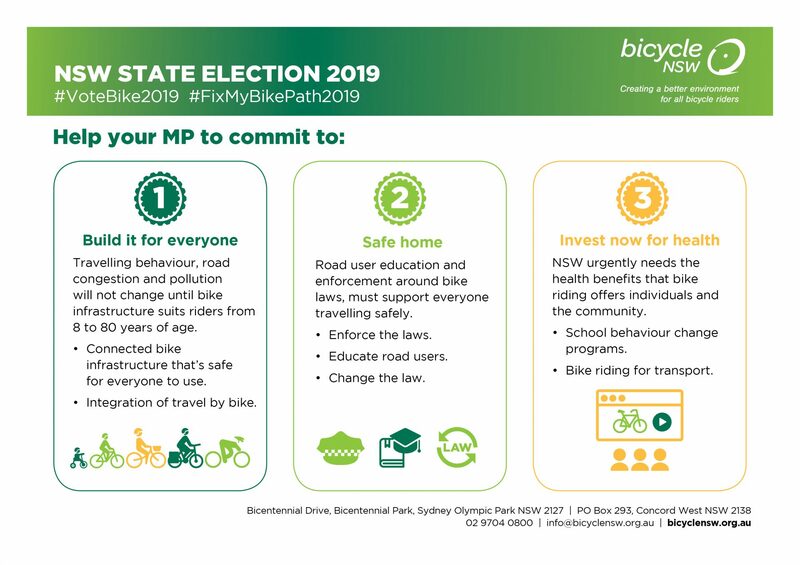 If you want things to change for bike riding where you live, we recommend you contact your local member of the NSW State Parliament, or candidates seeking election. They actually like hearing what is important to you. You can find your MP and their contact details here, or look out locally for other candidates seeking election. To raise your issues ahead of the election on March 23rd you can ask for an appointment, send a letter or get in touch via social media. Why not ask for a commitment to deliver what’s most important to you? Promises from MP’s are bike-riding gold. 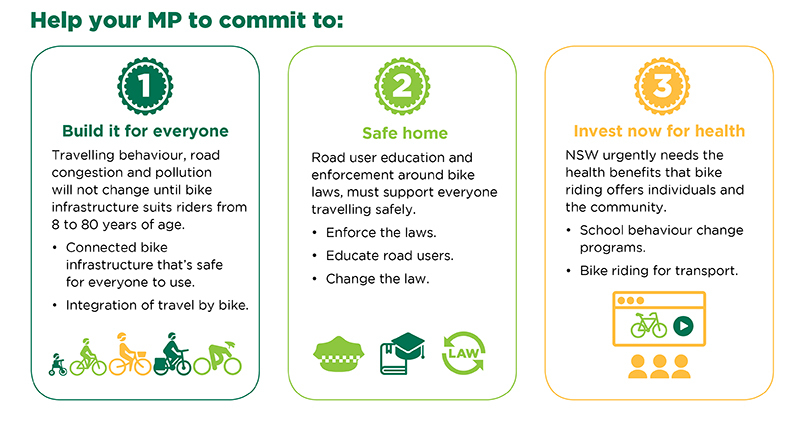 If you receive a promise to deliver things for bike riding, and the member or candidate is successfully elected, there are funds put aside to deliver - be sure to share it with us. MP’s and candidates usually have Facebook and Twitter accounts to help you get in touch with them and voice your concerns. Searching for their name on Twitter or Facebook will give you their handle. Why not share a picture of the place you want a bike path, crossing or a solution to dangerous infrastructure for bike riding? Or even draw them a picture of the cycling route you want to your school or local sporting field? Ask them to promise to get it done. Please feel free to use our infographic in meetings, to post or share it. Share what concerns you most. Is it infrastructure? Getting bikes on trains? More police enforcement of road safety? Driver education? Lower speeds in your town or suburb? The issues for under 16’s and their parents can be a bit different. Under 16’s are able to ride on footpaths instead of the road but for many children and families there are still a lot of barriers to being able to ride safely to school, the park, friend's places and all the places you want to go. Children can’t vote, but their issues matter to everyone – from traffic congestion and safe school zones to pollution and inactivity. We encourage families to highlight issues that matter to your children. Why not use their photos and drawings to make a point about safer paths, being active or riding to reduce traffic and pollution? A social media message with a great drawing can cut through in a world full of words. Does Your Community Need a Rail Trail? By converting some of the of the 3,100 km disused regional rail routes into rail trails, NSW could create world class, environmentally-friendly tourism assets, and new industries that revitalise communities. Regional NSW is missing out on the opportunities that rail-trails and off-road cycling facilities bring communities. These historic routes can be readily converted into safe, separated and scenic shared pathways, preserving transport corridors as public assets for the future. Developing rail trails provides opportunities for local people to participate in sport and active recreation including cycling, walking and horse riding. These routes attract visitors and provide new tourism opportunities generating jobs and new industries that help diversify and sustain jobs in rural and regional communities. Why not tell your local MP or candidate about the rail trail your community needs developed?